The use of mammalian and microbial cells in the production of biologics and vaccines is well established, and the majority of the top 10 drugs are now manufactured in this way. There is a significant and growing pipeline of new biologics (1), which in combination with increased pressure on cost reduction and generic competition from biosimilars (2), means that many biopharmaceutical companies are looking for ways to improve productivity in their development laboratories to ensure that upstream processes are efficient and robust. One of the main challenges for those companies is to minimise the high cost of goods that is typically associated with cell culture production processes to ensure the commercial viability of a therapy. For example, monoclonal antibody (MAb) therapies are required in large doses (6–12 g) to achieve clinical efficacy. That means they can cost tens of thousands of dollars per patient per year. Currently, the colorectal cancer treatments bevacizumab and cetuximab cost $20,000–30,000 for an eight-week course (2), well over 60 times more than comparable small-molecule therapies. driving biopharmaceutical companies to search for strategies to perform rapid process development for optimizing and scaling-up their manufacturing processes. Increasingly flat revenues and high development costs have made time-to-market crucial for company profitability. So there is a greater need to release products with desired quality attributes as early as possible. So for biopharmaceuticals, rapid and efficient process development is essential for successful commercialisation (3). One challenge for biologics manufacturers is the burgeoning number of new regulatory requirements. Before a drug or vaccine can be launched, its manufacturer must show that the product meets all regulatory requirements for high quality, safety, and effectiveness. Part of those requirements is to provide robust scientific evidence obtained during process development to support regulatory obligations. As a consequence, there is a need for multifactorial statistically designed research during process development and optimization, leading to a large number of bioprocess experiments, which can be labour intensive, time consuming, and expensive. 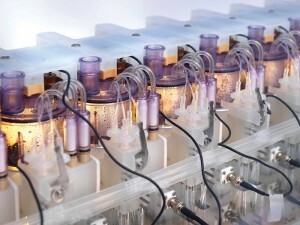 Traditionally, technologies such as shake flasks and bench-top bioreactors or spinner flasks for vaccine production have been used for process development. However this approach is manually intensive and prone to human error. It also has a high operating cost and requires a large laboratory. A well understood biologics manufacturing process is best developed by the application of complex DoE (design of experiment) methodologies. Such methodologies have a very high experimental burden (4). All areas of the process must be fully understood, including media components and all process parameters (and the effects of changing them), because such factors alter both titers and product quality attributes. Because of the inherent problems associated with traditional technologies, the resulting data can include a number of errors that require constant experimental iterations. Such issues lead to costs that are prohibitive to the development of many bioprocessing strategies. • parallel processing to allow evaluation of a wide experimental space, resulting in process understanding. Here I present an automated mini bioreactor technology that allows for high-throughput process development and optimization for both microbial fermentations and cell culture processes. In addition, I demonstrate the suitability of this technology by analyzing data obtained from an automated bioreactor and comparing data from laboratory- and pilot-scale bioreactors. components: easy-connect single-use 250-mL bioreactors (available in both microbial and mammalian configurations), an automated workstation, and software (Photo 1). The platform provides increased process volumes, pumped liquid delivery for continuous feeds, and automated individual bioreactor control for all parameters. These features allow a frequent feeding regime and larger volumes to be sampled for performing a wide range of analytical tests. Combined with the parallel control of culture conditions and feeds, such capabilities provide a scale-down bioreactor model that supports quality by design (QbD). 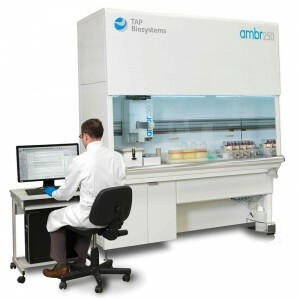 The ambr250 workstation is a class II laminar flow hood that is designed for either a 12 or 24 bioreactor workstation. Both configurations include an automated liquid handler for liquid transfer between bioreactors, sample beds, or media bottles and can be used for automated sampling, inoculation or even media preparation. 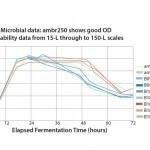 Scale-Up of Microbial Cells: To demonstrate that the ambr250 system is a viable process development and scale-down model for microbial culture, the results from cultures grown in the mini bioreactor, a bench-top fermentor, and a pilot-scale fermentor must be comparable. To this end, recombinant Escherichia coli clones expressing a therapeutic protein were chosen as the model organism. The clone cells were cultured in the ambr250 system, which used a single-use microbial bioreactor with a dual 20-mm Rushton impeller. The same clones were cultured in 15-L bench-top fermentors and in 150-L pilot-scale fermentors. All vessels were inoculated with 2–5% inoculum at an optical density at 600 nm (OD600) between 1 and 5. The cell lines were cultured for 72 hours in chemically defined medium at 37 ˚C, pH 7.0 ± 0.03, 30% dissolved oxygen (DO), and an impeller speed of gassed power per volume between 5.33 × 102 and 1.43 × 104 W/m3. Samples were analyzed every 12 hours for cell density using a SpectraMAX plus 384 spectrophotometer (from Molecular Devices) to measure the OD600 value of cells. With the bench-top and pilot-plant fermentors, the carbon dioxide evolution rate (CER) was measured using a Prima PRO process mass spectrometer (from Thermo Scientific). With the ambr250 system, built-in off-gas analyzers measured the CER, with each bioreactor having its own dedicated off-gas analyzer. 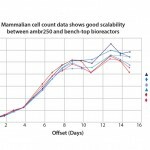 Scale-Up of Mammalian Cells: For the ambr250 bioreactor system to be a viable early process development model for mammalian cell culture, the results from cultures grown in it and a in a bench-top bioreactor must be comparable. To show this, recombinant CHO clones expressing a therapeutic antibody were chosen as the model organism. The clones were cultured in the ambr250 system using the single-use mammalian bioreactor and in 3-L bench-top bioreactors. The cell lines were cultured for 16 days in a proprietary, chemically defined medium at 37 °C, pH 7.0 ± 0.3, 40% DO, and with an impeller tip speed of 0.25 m/s. Cells were inoculated at 1 × 106 viable cells/mL, and samples were analyzed every 24 hours using a ViCell cell viability analyzer (from Beckman Coulter). Titres were assessed from day 2 and were then measured every 24 hours using a Biacore 400 analyzer (from GE Healthcare). 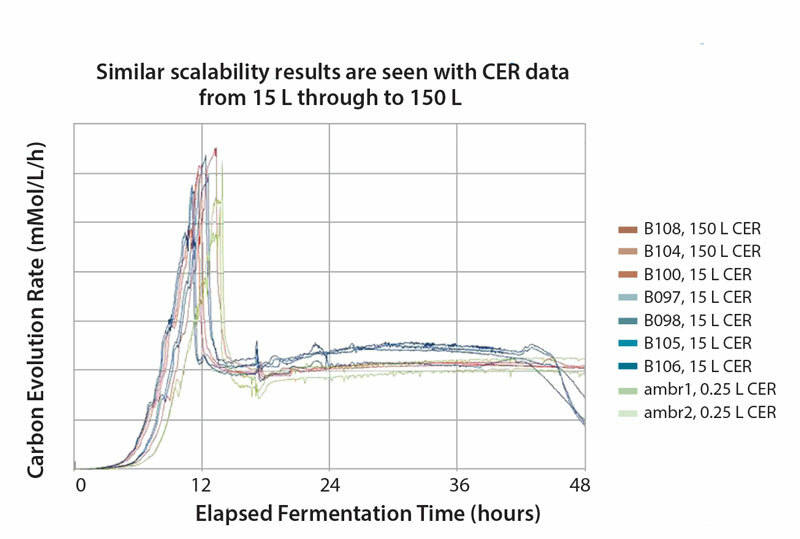 Scalability: Optical density and CER profiles of the E. coli strains cultured in the ambr250 bioreactor and 15-L and 150-L fermentors showed very similar results (Figures 1 and 2), with the OD600 data of the 15-L and 150-L vessels lying either side of the ambr250 data, and CER peaks at the same time points. 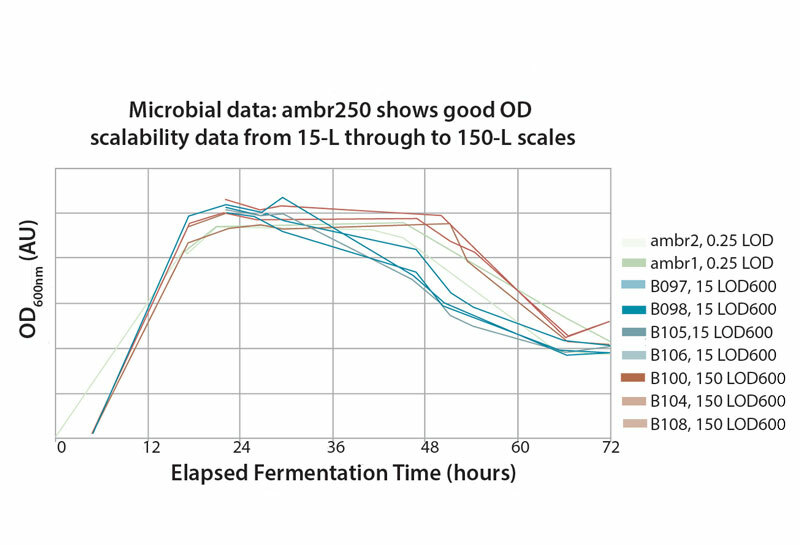 These results indicate that the ambr250 system provides the capability to be a good scale-down model for process development and optimization of microbial cultures. 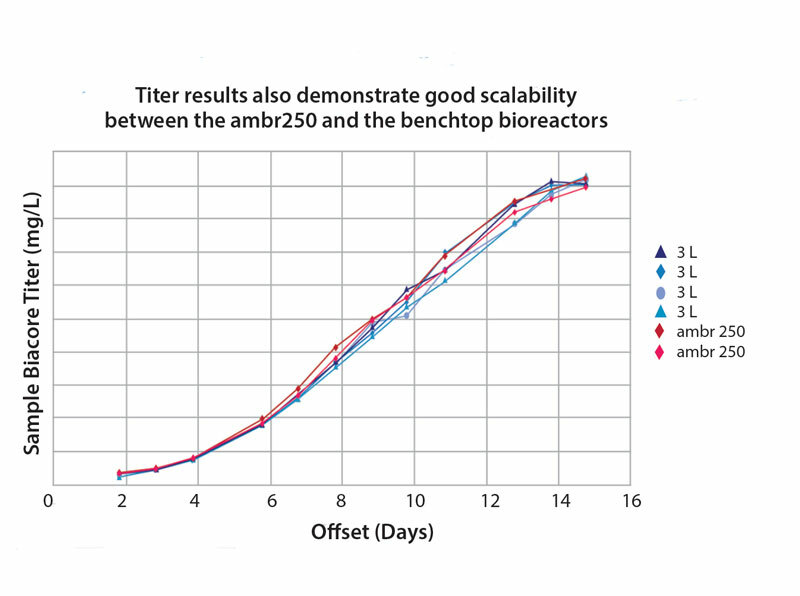 The consistent growth and titre profiles of the CHO clones cultured in the ambr250 and the 3-L bioreactor, showed good comparability (Figures 3 and 4) with peak viability, cell densities, and maximum titres at the same time points. 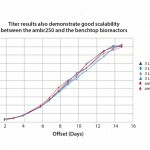 The data from the ambr250 system also showed better consistency than did the bench-top bioreactors. This indicates that process development can be reproducibly performed in an automated ambr250 bioreactor system with mammalian cell cultures. Here I outlined a parallel automated stirred mini bioreactor technology to allow for rapid process development and optimization for both microbial and mammalian cultures. 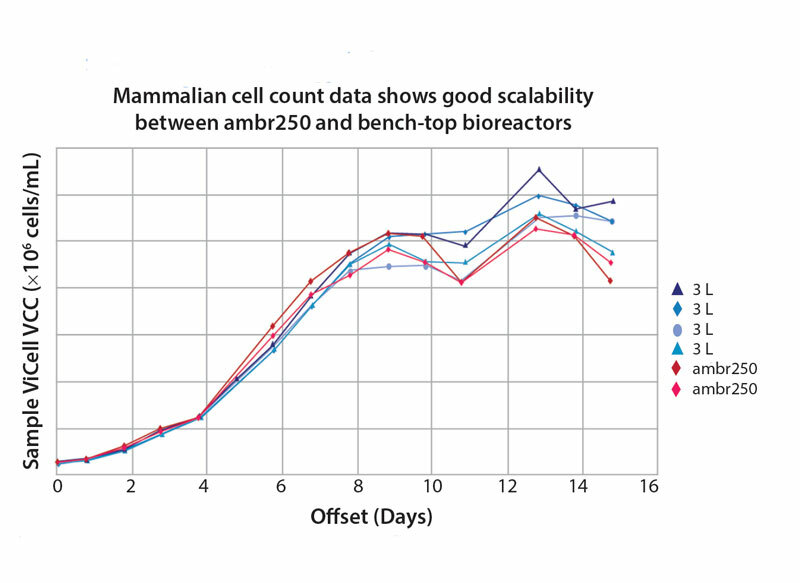 Results demonstrated that the ambr250 bioreactor system can replicate larger scales processes (laboratory- and pilot-plant) for both mammalian and microbial cultures, achieving similar results (cell density and titer). This is consistent with published data on CHO, demonstrating that automated mini bioreactors can mimic bench-top bioreactors (5, 6) and shows that an automated mini bioreactor is a comparable model for key parameters such as cell growth and titre in bench-top bioreactors. The ambr250 bioreactory system enables the automated operation of up to 24 mini bioreactors in parallel, so a full DoE run can be performed in one experiment. This means the study of multiple process parameters is no longer limited by the availability of bench-top bioreactors, operator time, and facility infrastructure. 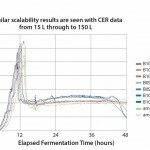 The application of an ambr250 bioreactor system could be used instead of shake-flask and conventional bench-top bioreactors models for process development and optimization. This would save considerable time and resources by reducing manual labour, laboratory support facilities, and large volumes of media. Because this platform is fully automated, easy to set up, fully disposable, and requires smaller culture volumes, scientists can program and perform high-throughput experiments while achieving highly accurate data. This significantly reduces the need to run repetitive experiments and makes this system a cost-effective tool for process development and optimization of biomanufacturing processes. The implementation of the ambr250 bioreactor system will improve data quality and allow more complex statistically designed experiments in both mammalian and microbial bioprocess development. This could lead to significantly shorter development timelines and lower costs associated with early stage process development and, ultimately, may contribute to quicker technology transfer and a faster time to market of more affordable biologic drugs and vaccines. 1 Biot J, et al. From Orthoclone to Denosumab, the Fast-Growing Market of Monoclonal Antibodies. Med. Sci. 25(12) 2009: 1177–1182. 2 Cornes P. The Economic Pressures for Biosimilar Drug Use in Cancer Medicine. Target Oncol. 7(supplement 1) 2012: 57–67. 3 Rahul B, et al. High-Throughput Process Development for Biopharmaceutical Drug Substances. Trends Biotechnol. 29(3) 2011: 127–135. 4 Bareither R, et al. Automated Disposable Small-Scale Reactor for High-Throughput Bioprocess Development: A Proof of Concept Study. Biotechnol. Bioeng. 110(12) 2013: 3126–3138. 5 Hsu WT, et al. Advanced Microscale Bioreactor System: A Representative Scale-Down Model for Bench-Top Bioreactors. Cytotechnology 64(6) 2012: 667–678. 6 Lewis G, et al. Novel Automated Micro-Scale Bioreactor Technology: A Qualitative and Quantitative Mimic for Early Process Development. BioProcess J. 9(1) 2010: 22–25. Mwai Ngibuini is manager at Sartorius Stedim Biotech/TAP Biosystems, York Way, Royston, Hertfordshire, SG8 5WY, UK; 44-1763-227200.